It all started in the late 19th century where colonial Europeans using their divide and conquer strategy dismantled a United African country, Rwanda, into two ethnic groups (Tutsi and Hutu) that changed the socioeconomic power structure of the people of Rwanda forever. The Germans before WWI and the Belgians afterwards had to have allies in Rwanda and who would have thought the size of ones nose would be a way to distinguish ones superiority over another. Tutsi, the minority population with a European looking nose structure, long and narrow in size and the Hutu with their wider nose measurement were the distinguishing symbol that divided a once United African country into enemies across ethnic lines. The Tutsi were favored because of the belief that they originated from Caucasian blood as a result were given opportunity to be educated and participate in the Belgian colonial government. These obviously was a discriminatory favoritism of the Tutsis over the Hutu which forever left a scar and resentment on the Hutu majority. In 1920, it was the law of the Belgians to require people in Rwanda be identify by ethnicity between Tutsi and Hutu. They say it was for censuses purpose but the actual reason could not have been mistaken as it was the colonials trademark to divide, favor one group over another to create animosity across ethic groups. The strategy had been to conquer them by destructing them from focusing at the core issue of illegal occupation and forced enslavement. As a result, today we still have a generational divide in Rwanda and many other African colonies. One of the reason I still can't seem to have it in me to fully embrace President Clinton and U.S. Secretary of State Madeleine Albright even though Clinton had issued a sorry apology regardless of the many good things his Administration had done, is because of the cynical attempt made early on by his administration to denying the most horrendous mass killings of modern times in Rwanda and its non-stop efforts to cover up the scale of the atrocity early on. Not only did the Administration trying to minimize the death toll, SoS Albright, UN Ambassador then, "single handily prevented the Security Council from beefing up the mission in Rwanda". "Influential nations such as America, France, and Britain all abandoned Rwanda in its time of need. The United Nations Security Council also failed to act to help cease the genocide." 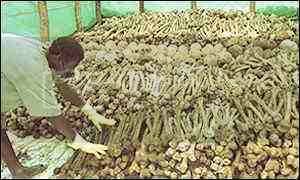 It took 100 days and close to hundreds of thousands dead bodies all over the streets of Rwanda for Rwanda to get the kind of attention it got from the the world community. 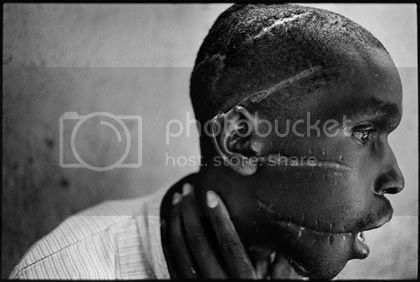 100 days and 1,000,000 dead, beaten and cut into pieces by machetes where hands, legs, and heads were chopped all because of the seed of poison planted centuries ago by the Germans and Belgians to divided and conquer the people of Rwanda. Why did it take so long and so many deaths to try to stop the genocide? The simple answer is because Rwanda did not have any strategic, political or economic significance, something like "oil" to those influential nations who tip toe the balance of power in other nations affairs and if our history is any indication the United States has been guilty of that straight-up. Being an African country/a black majority does not help to get the kind of attention other countries of interest get so long as these countries keep their people quiet, suppressed and controlled and under a 20 plus years of dictatorship, not to mention so long as they do the killing of their political opponents in silence and quietly outside of the mainstream media. The destiny of Africans since the colonial times has never been doomed with so much interference from profiteering nations and that legacy still continues to this day. In fact, depending on how you define genocide, I would personally call what African countries are facing a genocidal challenge since many African people are plagued by disease, famine, and war all over the continent where the world has accepted it as - well, that is just AFRICA while the west continues to steal its resources. The numbers are staggering. Each year, more than $1 trillion exits developing countries, and more than $140 billion of comes from Africa. That's almost four times as much as the continent gets in official development aid. Sub-Saharan Africa may be the world's poorest region, but it's also its leading net creditor. The key players in this shadow economy are corporations. Globally, more than 60 percent of capital flight comes from multinationals operating in resource-rich regions. Here's how it works: Instead of declaring profits where they earn them, companies use a mechanism called transfer pricing, wherein internal corporate revenues are "moved" from one part of a company to another. Each year, African countries lose billions in tax revenue to home countries or tax havens as a result. Meanwhile, instruments such as "tax competition" designed in theory to attract foreign direct investment, are primarily utilized in practice by corporations seeking to exploit finite natural resources. Four million African kids under the age of 5 had died in 2009 while less than 100,000 died in industrialized countries for lack of basic health care while Pfizer or Norvatis think producing medicines to treat separation anxiety or Alzeheimer's disease in dogs is more important than the life of a human being in Africa. If this is not putting a blind eye to genocide, I don't know what is. Foreigners can provide all sorts of help—moral, political, diplomatic, and even material. Maybe neighbors, who share ethnicity and religion with the Libyan people, could do more. But a military attack of the sort now in progress is defensible only in the most extreme cases. Rwanda and Darfur, where we didn’t intervene, would have qualified. Libya doesn’t. "We as Libyan Americans and Libyans are very appreciative of not just what the international community has done, but what the United States has done what other partners, Arab countries, as well as Europeans (have done)," the president of the American Libyan Council Fadel Lamen told reporters at the National Press Club. The group showered President Obama with praise for his decision to involve the U.S. military in enforcing UN Resolution 1973, saying the president's decision saved lives. "We strongly support President Obama’s stance on the Libya crisis," said Esam Omeish, director of the Libyan Emergency Task Force. "His actions have saved thousands of lives in Benghazi and elsewhere." Omeish added that the Libyan American community is "eternally grateful for the timely and swift response and intervention of the international community." At this point, the United States and the world faced a choice. Gadhafi declared he would show "no mercy" to his own people. He compared them to rats, and threatened to go door to door to inflict punishment. In the past, we have seen him hang civilians in the streets, and kill over a thousand people in a single day. Now we saw regime forces on the outskirts of the city. We knew that if we wanted — if we waited one more day, Benghazi, a city nearly the size of Charlotte, could suffer a massacre that would have reverberated across the region and stained the conscience of the world. It was not in our national interest to let that happen. I refused to let that happen. And so nine days ago, after consulting the bipartisan leadership of Congress, I authorized military action to stop the killing and enforce U.N. Security Council Resolution 1973.
why intervene in Libya, but not Yemen or Bahrain? The question reflects a simplistic equivalence that ignores a fundamental reality: Despite the rhetoric of universalist democracy, effective foreign policy demands a balance between our interests and our ideals. In Bahrain, a longtime ally at a strategically important location on the Arabian Peninsula, the conflict is at least as sectarian as it is political. It would be a disaster to have one free election there where Shiites sympathetic to Ahmadinejad and the ayatollahs would prevail and then close the process down, allying or ultimately even merging with Iran, which covets Bahrain as just another Iranian province. This wouldn’t be democratic in any true and lasting sense. That’s something else Obama can’t say, so he urges a process of peaceful consultation while Saudi Arabia dispatches troops to restore order. Maybe, just maybe, there will be some incremental progress toward wider political participation. But Bahrain isn’t Libya — and the pursuit of American values can’t be a heedless exercise that vitiates American interests. Make no mistake about it that President Obama will have the interest of the United States first without hesitation but I will also guarantee it within the power he has he will not allow inhumane atrocity to occur without weighing in on it if lives are on the line from day one as was the case in Libya. However, it would be foolish to assume he or any future President will not be continuing to look the other way at some point in time for the wrong reasons as long as the United States keeps continuing to import 10 million barrels of foreign crude oil a day and keeps going through 19 million barrels of oil a day. The answer has been pretty black and white for decades and it is the United States choice to tackle and reduce our oil dependency by investing more in clean energy. In the mean time until we become energy independent who have mastered a new wave of clean energy to fuel our economy, with our deficit spending in control, the following leaders in Africa (noted below) since the world community don't see any strategic, political or economic significance in them will be allowed to quietly oppress, enslave and murder their people. Or may be we will find oil in these countries like we did in South Sudan where the world community intervened to stop the genocide that claimed 400,000 lives and displaced over 2,500,000 people. 1) Equatorial Guinea: Teodoro Obiang from August 1979. Almost 32 years. 2) Angola: Jos‚ Eduardo dos Santos from September 1979. Almost 32 years. 3) Zimbabwe: Robert Mugabe from April 1980. Almost 31 years. 4) Cameroon: Paul Biya from November 1982. Almost 29 years. 5) Congo (Brazzaville): Dennis Sassou-Nguesso from 1979-1992, five years in opposition, and again from 1997. 27 years. 6) Uganda: Yoweri Museveni from January 1986. 25 years. 7) Burkina Faso: Blaise Compaore from October 1987. Almost 24 years. 8) Sudan: Omar al-Bashir from July 1989. Almost 22 years. 9) Chad: Idriss Deby from December 1989. More than 21 years.. 10) Ethiopia: Meles Zenawi from May 1991. Almost 20 years. 11) Eritrea: Isaias Afewerki from May 1993. Almost 18 years. 12) The Gambia: Yahya Jammeh from July 1994. Almost 17 years. The sad things about all of these countries is that the poisonous seed planted during the colonial times continue to have a strong hold on their destiny because what we have still is African people whose mindset is segregated across ethic lines that continue to divide them against their own self interest. However, with all the injustice in the world, here is the punch line at least for me - America may not be the best country in the world but there is no other better place to live-in than America. So, to answer the question, How Big Is Your Nose?... ...Well, my nose is an average size, big, crooked and straight from the motherland imported some 30 years ago to a place I call home, the United States of America, at a young age seeking a better life and education and I refuse to allow anyone to divide and conquer me like it was done to the Tutsi and Hutu in Rwanda or like this idiots who would love to see me enslaved. But, don't worry, I got a pretty nose that can sniff through all the good, the bad and the ugly. Peace!